Travel continues to be a source of inspiration for Alessandro Michele. 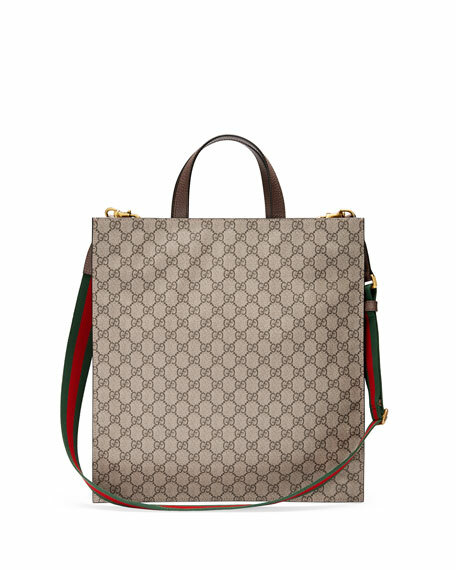 A collection of bags in the GG motif is enriched with a blend of contemporary embroiderieslike the UFOand vintage inspired details, including airmail trims and a Gucci print from the archives. The appliqués are individually embroidered and then skillfully hand-applied to each piece by specialized artisans. This process ensures that no two items will be alike, giving each a one-of-a-kind appearance. Beige/ebony soft GG Supreme, crafted from a coated microfiber fabric. Brass hardware and brown leather trim. Leather tote handles with 4.5" drop. Detachable, adjustable green and red Web shoulder strap with 21" drop. Embroidered UFO, Angry Cat and cloud appliqués. 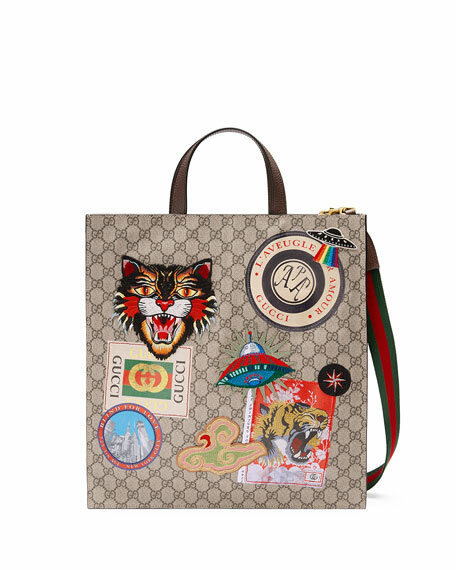 Gucci logo and printed appliqués. Magnetic snap closure secures top of bag. Cotton linen lining with airmail piping. 14"H x 11"W x 1.4"D.
For in-store inquiries, use sku #2251796.